Investigations begin into yesterday’s Cork disaster, with both flight recorders recovered – but it could take some time. 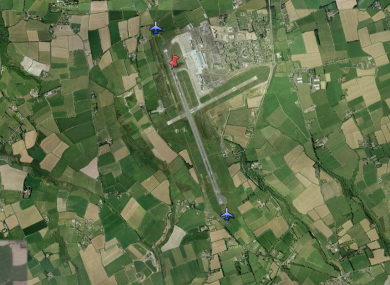 The three locations at Cork Airport where flight MN7100 tried to land, with the accident site marked in brown. AN INVESTIGATION involving the aviation authorities of four countries will today begin to piece together the chain of events that led to yesterday’s air crash at Cork Airport, in which six people lost their lives. The Manx2 flight MN7100 from Belfast to Cork crashed on landing at its third attempt amid heavy fog, with the loss of six lives, shortly before 10am yesterday. An investigation will include authorities from Ireland and the UK, as well as Spain – with the flight being operated by Barcelona-based airline Flightline BCN – and the United States, where the Metroliner aircraft was manufactured. RTÉ reported that both of the plane’s ‘black box’ flight recorders – the flight data recorder, and the cockpit voice recorder – had been recovered, which will assist investigators in piecing together the exact chain of events ahead of the ill-fated third landing attempt. Though the Irish Times believes an initial report could be compiled within a month, RTÉ said a final report into the disaster – thought to be the worst ever to occur at an Irish airport – could take more than a year, citing legal and financial complexities. A book of condolences for the six victims is being opened at County Hall in Cork this morning. Speaking last night, Manx2 chief executive Noel Hayes defended the actions of the crew, who had attempted the third landing despite the obviously difficult conditions. The crew had followed standard procedures, the Irish News quotes him as saying, though he acknowledged that the plane could have been diverted to other airports if the need had arisen. The Irish Examiner quotes a former Aer Lingus training captain as believing, however, that the pilot could have placed himself under unnecessary pressure by attempting a third landing at the airport after the first two had been unsuccessful. The Examiner reports elsewhere that the plane had been used as a cargo plane in 2004 when it veered off the runway amid takeoff on the Spanish island of Majorca. The plane had “veered and skidded on the runway shoulder before turning almost completely around, and coming to a stop about 135 metres of the runway in a grassy area,” Pat Flynn writes. The precise cause of the problem with the plane’s nose wheel was not determined. The same inquiry found that a warning light indicating problems with the nose wheel had been illuminated on previous journeys. Cork Airport is a relatively high-lying airport, with its main runway over 150m above sea-level – meaning that the area is particularly susceptible to heavy fog conditions. Email “Report into Cork disaster could take 'more than a year'”. Feedback on “Report into Cork disaster could take 'more than a year'”.